If you're like most baseball fans, you're enjoying the World Baseball Classic. At its best, like the Venezuela-Dominican Republic matchup or the U.S.-Japan brouhaha, there has been almost a postseason tension to the games. At the very least, it beats the hell out of a Brewers-Padres Cactus League game at Peoria. The WBC does present a terrible dilemma for American fans, however. Do we root wholeheartedly for the country of our birth -- the beacon of democracy, the arsenal of liberty, the leader of the free world, the nation that symbolizes all that is good and right in the world (well, most of the time), the home of jazz, baseball, apple pie and Disneyland? Or, do we root against the Yankees on the team? Sure, the answer seems simple enough. 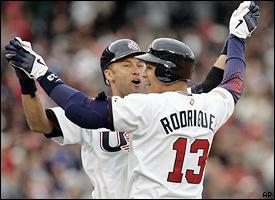 You root against Jeter and A-Rod. After all, putting God and country first is a noble ideal, but these are Yankees we're talking about! but no less patriotic than the Yankees themselves. Alex Rodriguez, evidently taking his cues from a Magic 8-Ball, flip-flopped repeatedly over whether he was going to play in the WBC and which uniform he would wear if he did take part. He would play. He would not play. He would play. He would not play. He would play, but for the Dominican Republic, to honor his family. No, he would play for the U.S., the country where he was born and raised. No, he wouldn't play after all, so as to offend no one. No, maybe he would play after all, but for the Netherlands, because he has a time-share in Curacao. Then there's George Steinbrenner, who talks a good game by playing "God Bless America" during each and every seventh inning stretch, serving on the U.S. Olympic Committee, and illegally donating money to secret presidential slush funds. But when push comes to shove, his bottom line always trumps his national allegiance. 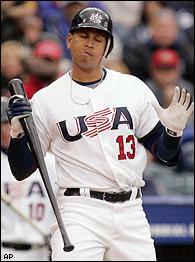 We've seen that before, when he refused to let Yankees prospects play in Olympic qualifiers. And we saw it again this winter when he constantly whined about how much he hates the WBC and how disruptive it is to the Yankees' sacred spring training agenda. He even had the team post a sign at a Yankees spring training game, apologizing to fans for the absence of such players as Jeter, A-Rod and Johnny Damon, in a petty attack on the WBC. And now we're supposed to root for these guys, just because they're wearing stars and stripes on their sleeves instead of pinstripes? I'm sorry. If Clay Aiken sings the national anthem before a World Series game, that doesn't mean we have to buy his albums. That said, even the most passionate Yankee haters must have finally relented in the bottom of the ninth inning of Sunday's Japan-U.S. game -- with two out, the score tied 3-3, the bases loaded, our country desperate for a hit, and the reigning American League MVP stepping to the plate. In such moments, love of country finally wins out and overcomes generations of anti-Yankee animosity to bring us all together in a show of patriotic support. "C'mon, you [expletive], pinstriped turncoat," Americans shouted at their TV screens. "For once -- just once -- in your soulless, empty life, get a hit in the clutch you greedy, insincere, two-faced, overpaid fraud!" And sure enough, aided by this great outpouring of national love, A-Rod slapped a dribbler up the middle that somehow eluded the Japanese infielders for the game-winning single. I tell you, seeing the U.S. team celebrating and congratulating A-Rod made you want to tie yellow ribbons around old oak trees, kiss nurses in Times Square and phone in your vote to "American Idol." "Where did you come from, where did you go? Where did you come from, Cotton Eye Joe?" Jim Caple is a senior writer at ESPN.com. His first book, "The Devil Wears Pinstripes," is on sale at bookstores nationwide. It also can be ordered through his Web site, Jimcaple.com.